Beautiful large vertical format woodblock print made by the artist Utagawa Hiroshige II (二代目歌川広重) and depicting the oldest stone arch bridge in Japan, the Meganebashi (眼鏡橋), built in 1634 in Nagasaki (長崎), in the ancient Hizen province (肥前国), and whose name literally means "the spectacles bridge" since the reflection of its two arches on the water creates the illusion of looking at a pair of glasses. 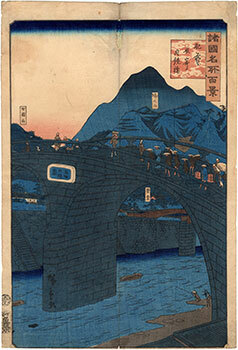 The work was printed in 1859 and is taken from the series Shokoku meisho hyakkei (諸国名所百景), ie "One Hundred Views of Famous Places in the Provinces", produced by the publisher Uoya Eikichi (魚屋栄吉). 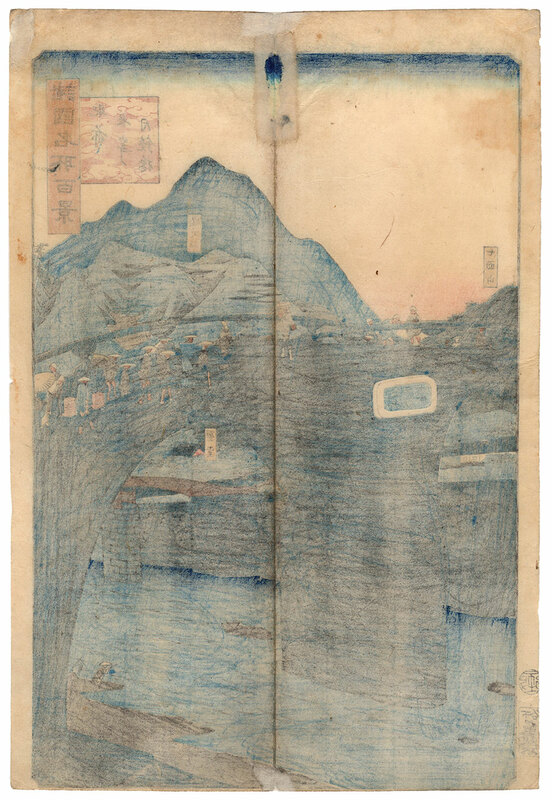 The print on Japanese washi paper (和紙) shows the right signs of aging as well as small restorations and a vertical folding mark.